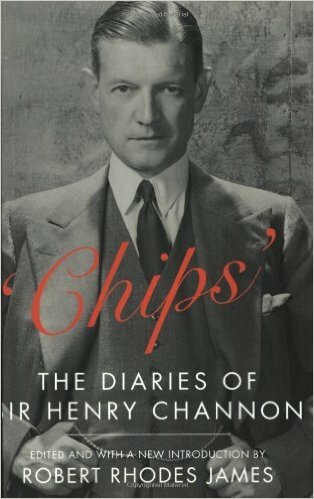 In view of my plans to campaign for the publication of the full version of Chips Channon's diaries I have started re-reading them. I have a copy (much used ) of the 1967 version but the 1993 version has no changes, merely a short new introduction by Robert Rhodes James. Though the newly found late diaries are mentioned they are not added as too many people were still alive (actually not that many by 1993 but both Paul Channon and Robert Rhodes James had been scarred by the original reception of the book). The moment one starts reading those entries one becomes engrossed. The people and events are fascinating and Chips's descriptions are enthralling. Some of the people are little known these days and so one cannot be sure whether he is right or wrong in his judgements (were those peeresses really so dowdy?) but others are historically important figures and then one can weigh up whether one agrees with him or not. His adoration of Chamberlain is a little surprising not because the man was evil personified as some people would have it - he was not but a very capable and well-meaning politician - but because there is no evidence that he had the personality, which could excite adoration. Even in this case Chips mentions several times that the government had become a one man show, which is not healthy, and enumerates the speeches that are not all that good in his opinion. as Chips wrote on May 3, 1939. Ah yes, I hear people say, but what of his own lenient attitude to the Nazi regime. Indeed, he was not really harsh enough about them but it is not true that he was always lenient or even pro-Nazi. That is a big subject and I need to write a separate post about it. For the moment I shall keep to the subject of Chips on some of his colleagues in the House of Commons. He is particularly interesting on Eden, whom he likes personally and whose charm he freely acknowledges but whose abilities he considers rather mediocre and whom he fears because of his lack of control in his international likes and dislikes. His prediction is that Eden's career will continue to be catastrophic, something that was seen to be completely wrong for a while but was eventually proved to be correct. For this, if no other reason, one would like to read Chips's late diaries, which must cover the Suez fiasco and the final collapse of that career. All morning at the FO intriguing and arranging matters, and the hours passed in a confusion of secret telephone calls and conversations. The startling thing about my intrigues is that they always come off. On the whole that was probably true though eventually he did not manage to keep his job but then neither did RAB. It does, however, explain why Chips had such a multitude of enemies as well as friends. It is always difficult to work out who can be described as conservative if they are not Conservative and part of the British political scene. Harold Williams, a New Zealander who came to Britain and became a highly regarded journalist, reporting from Russia and becoming eventually Foreign Editor of The Times (when it was still the Thunderer and not a gossip rag) probably saw himself as a "liberal" and, indeed, in Russian terms that is what he was, becoming involved with the Kadets through his wife, the formidable Ariadne Tyrkova, first woman member of the Kadet party's executive committee. So he was not an old-fashioned monarchist, which would have made him conservative in Russian terms. But the Kadets and many of the White army officers Williams felt close to would have been conservative or even Conservative by British standards. During the First World War Williams together with the novelist Hugh Walpole set up the British Propaganda Office in Petrograd, promoting Britain in Russia as opposed to Russia in Britain. Williams and his wife supported the February Revolution, not least because they, like so many other people, thought that this would stiffen the Russians' fighting ability as well as help the country develop into a democracy. Things did not turn out that way. 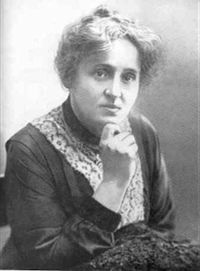 Both Tyrkova and Williams opposed the Bolshevik coup (she had taken Lenin's measure years before when both of them were emigres in Switzerland) and had to go into hiding, eventually making their way to England where they both wrote about the situation Bolshevik Russia. Before that Williams reported from the Brest-Litovsk negotiations, giving possibly the best and most detailed account of what went on. This is important to note because of what happened later with his reputation. When the Civil War broke out both the Williamses went back and he became war correspondent with Denikin's army. As the Whites lost the war Williams's reputation declined. He may or may not have been reporting accurately or objectively (nobody was, as it happens) but he was involved with the losing side so he had to be wrong. 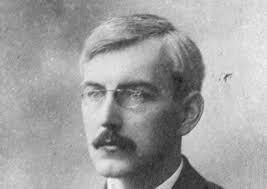 That accounted for him finding it hard to get work in journalism when he eventually came back to Britain but that, too, changed when, in 1921, he became Foreign Editor of The Times. He died in 1928 and that may have contributed to him becoming less important in accounts of journalistic reporting from Russia. The fact that he was fiercely anti-Bolshevik did not help either. In her recent biography of Harold Williams, slightly awkwardly entitled Russia's Greatest Enemy? : Harold Williams and the Russian Revolutions, the historian Charlotte Alston says in the Introduction that opinions of his journalism were mixed. She then proceeds to quote Maxim Litvinov, the first Soviet Plenipotentiary in Britain who called Williams Russia's greatest enemy but was hardly an objective witness; also Arthur Ransome who was as fiercely pro-Bolshevik as Williams was anti and who saw no need to help his friends the Williamses as they ran for their lives in late 1917; and Philip Knightley who, in his history of war correspondents, The First Casualty, that Williams's very personal involvement with the White movement made him the least reliable correspondent of the period and he ought never have been sent to cover the Russian Civil War. Presumably, Knightley does not think highly of Bernard Pares or Robert Wilton, who was seriously right-wing even by Russian standards, either. On the other hand, why should one think that Arthur Ransome, who was very personally involved with the Bolsheviks (close friend with Karl Radek and others, married eventually one of Trotsky;s secretary) was in any way reliable. Harold Williams was also a remarkable linguist, picking up languages with ease from a very early age and writing grammar books for those who did not have one. He is said to have known fifty-eight languages but that may be just a myth. Possibly it was no more than fifty. Harold Nicolson, who also reviewed Tyrkova-Williams's biography, painted a picture of Williams lisping in Maori, speaking in Serbian with a slightly Croat intonation, Rumanian with a Bessarabian lilt and Swedish with 'a decidedly Norwegian accent'. One cannot help wondering how Nicolson, who knew none of these languages and did not think highly of the people in question could discern this. The likely explanation is that he considered both Williams and his wife to be "bedint", his and Vita Sackville-West's favourite term for people they did not think were quite - quite. It seems about time to start that campaign to have the whole of Channon's diaries becoming available and, indeed, published, as I wrote some time ago. The published diaries are fascinating and often remarkably accurate, despite a comment made by one reader on my posting. Chips may have been shallow (what politician is not?) but his judgements were remarkably accurate and his knowledge of what was going on phenomenal, With all the diaries in the public domain we would see more of that. I found a newspaper article (or part of it) from 2007 that talks of the diaries being published in full. I assume it was an item in Londoner's Diary, the gossip column of the Evening Standard, not the most reliable sources of information. I can find no trace of such a publication and I am sure I would have noticed. There is a biography of Channon, published in 2011, by Richard Carreño, which will have to be tracked down. In the meantime, I shall have to re-read the existing diaries (well someone has to do these chores). I wanted to get hold of the later edition with that new introduction by Robert Rhodes James but have experienced some difficulty in that. So, the 1967 edition it will have to be. My one problem is that my copy is falling apart. Indeed, I keep it together, somewhat inelegantly, with a rubber ring. Chips would have been horrified. A visit to the Charing Cross Road bookshops is indicated. It will all make a very good change from the other book I am reading, Tolstoy and his disciples by Charlotte Alston. In fact, there could not be a greater contrast. There is no question: this blog has been shamefully neglected and one of my resolutions for the start of the new academic year, which, out of old habit, I consider to be more important than the start of the calendar one, is to post on it articles long and short several times a week. Indeed, I fully intend to post articles by other people who consider it worth their while to send me any. Everyone will be fully acknowledged and necessary links put in. Let me start with a link to an article in an American conservative publication, actually the American conservative publication, the National Review, Bill Buckley's brain child still going strong. The article is by John O'Sullivan, one of the leading conservative thinkers on both sides of the Pond and, these days also in Australia. He is also the onlie begetter of O'Sullivan's First Law, which states that "All organizations that are not actually right-wing will over time become left-wing." The article is about Theresa May, the second woman Prime Minister of the United Kingdom. Incidentally, how many will there be before the Labour Party has a woman leader? Ho-hum, I hear you say, how is that related to history? Well, the article places the discussion of her personality and what we know about her ideas (with a good deal of criticism as well) in a historic perspective with references to Margaret Thatcher (naturally) but also to "our Joe", Joseph Chamberlain and his social ideas that have become a very strong strand in Conservative thinking. How will Theresa May cope with the various problems that have emerged since "our Joe" and his ideas about the working class while concentrating on the complex issues around the Brexit negotiations? We do not know at this stage and can only guess. The article covers many issues and is very well worth reading in its entirety to which end I shall post no quotes. Go away and read it.